David Shields kicked things off with a witty and well judged provocation that revisited themes from his book Reality Hunger: A Manifesto, about remixing, plagiarism, non-fiction, reality, and the culture of appropriation. He quotes Malcolm Gladwell in “Annals of Culture”, New Yorker, on the thin line between legal and moral plagiarism: “When I worked at a newspaper, we were routinely dispatched to “match” a story from the Times: to do a new version of someone else’s idea. But had we “matched” any of the Times’s words – even the most banal of phrases – it could have been a firing offense. The ethics of plagiarism have turned into the narcissism of minor differences: because journalism cannot own up to its heavily derivative nature, it must enforce originality on the level of the sentence.’ Shields calls this ‘Trial by Google’. Falling in behind him in the (very long) line for drinks on the first evening, I pressed him on the serious issues behind his breezy bricolage. 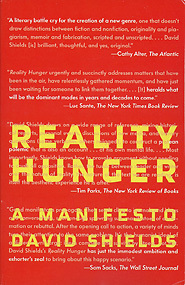 In Reality Hunger, Shields assembles other folks’ memorable thoughts and aphorisms as an enjoyable enquiry into contemporary cultural forms. But what if, I asked him, someone gouges juicy bits from a non-fiction writer’s hard-won research, and recycles them, thinly veiled, as their original fiction? Is this remix or rort? He frowned, confessed a lack of knowledge of Australian copyright law. Morally, though, he offered a judgement. If the usage of the ‘borrowed’ material was transformative – that is, if it was not used in a similar context as the original, pertaining to similar activities and situations, or for a similar purpose, then, Shields told me, it could arguably be acceptable re-use, justifiable in the service of creating a totally new work of art. Otherwise not. We reached the counter, where he confronted a new dilemma – whether to tip the bar worker who handed him a can of VB beer. That, at least, was easily decided. No, the waitress said. But her reply needed historical context. I quickly filled him in on the stonemasons who in this very city in 1856 had won the world’s first eight-hour working day, ensuring a tradition of respect for working conditions that had led to award wages that would be the envy of the diner waitress we met in Chicago in 2011, who had to rely on clients’ tips to supplement her menial $2.50 an hour wage. The morning we had breakfast, five tables of Danish students and their minders had just stiffed her. By this stage, Shields was looking edgy, so I ceded the space to his circling fans, and headed to a corner of the rooftop terrace to contemplate the view of Melbourne below, and the rubbery nature of ‘remix’. Next day I joined ABC radio/online producer, film-maker and RMIT lecturer Kyla Brettle, RN producer and ABC Pool co-founder Sherre DeLys, and University of Iowa scholar Jeff Porter for a panel on Sonic Writing: Radio Nonfiction, chaired by Professor Ross Gibson of University of Technology Sydney. We were there to discuss the expressive nature of sound in relation to other media in the context of radio nonfiction, a genre that shares with literary journalism and documentary film the common goal of examining and constructing unfamiliar worlds that have special relevance to a broader understanding of our collective selves. Radio nonfiction (particularly the radio documentary) is unique for asking us not to read or gaze at its subjects but rather to hear and listen to their divergent voices and unique soundscapes. This panel discussed the emergence of the radio documentary as a noteworthy turn in the growth of contemporary nonfiction. In particular, the focus was on the way sound interacts with words and influences the meaning of a radio text in surprisingly powerful ways. As many sound makers testify, spoken language is only part of the mix: the editing and layering of sounds, music, voices, and ambience more often than not will reshape the narrative dynamic of any documentary radio text. More by serendipity than design, the presentations extended and complemented each other, though the too-brief time for questions afterwards was disappointing. AUDIO of panel here. Order: Kyla, Siobhan (15 minutes in), Sherry, Jeff. Later in the week, Helen Garner, as surprised as the rest of us to find she’s almost 70, revealed delicious trade secrets. Age only deepens her insight, her writing these days a killer combination of observation and understanding, as she teases out complex human dramas with wisdom, anger and compassion. Video of her talk HERE. 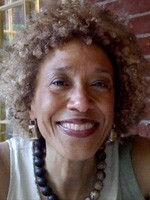 Margo Jefferson, a Pulitzer Prize-winning cultural critic and former staff writer for The New York Times, responded drily to her fulsome introduction by quoting the French writer Collette: ‘what a wonderful life – I wish I’d noticed!’ The Chicago-raised African-American tackles head-on cornerstone issues of US society such as race, and told us she wants to reclaim ecstasy in cultural criticism: the ecstasy of curiosity, and of loathing. Margo’s talk here. Final session, ‘Out of Place’ had an (unexpectedly) delightful panel linked to Canberra (hence the unexpectedness). Partly due to the range of speakers, from the chair (cartoonist Judy Horacek) to the themes (Francesca Rendle-Short on her unusual family, Kim Mahoud on occupying a strange white/blackfella interface, Robyn Archer a forcefield on 100 years of Canberra). All rounded off by a brilliant presentation by Margo Neale, Indigenous art curator at National Museum of Australia, which showed, clear as the nose on your face, through juxtaposition of slides of remote Indigenous-occupied Australia and paintings and drawings of those scenes and locales that, as Margo said, Indigenous art is not about country – it IS country. Go Margo! Thanks for that revelation: simple but stunning. « ABC Radio National cuts: the new cultural cringe?